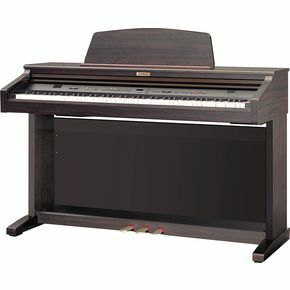 Featuring our famous wooden-key action, the CE200 digital piano offers the finest touch available in a digital piano. With superior sound technology and a rugged, yet beatiful cabinet, the CE200 is a great choice in a high-quality digital piano. The CE200 utilizes Kawai’s acclaimed Harmonic Imaging Sound Technology to create its impressive piano sound. The CE200 offers the finest touch available thanks to the AWA PROII wooden-key, graded-hammer action with counterbalancing. The CE200 has both a Dual Mode in which two sounds are played at the same time and a Split mode in which one sound plays on the left of the keyboard and another sound plays on the right side. A unique Balance Slider on the panel can control the volume balance in a Dual or Split keyboard mode. The CE200 has a special 4-Hands Mode in which two identical 44-note pianos are setup on the keyboard – great for piano lessons or for duets. Two headphone jacks allow two persons to listen to the piano in privacy. A built-in sliding key covers protects the keyboard from dust and debris when the instrument is not in use. The CE200 has three pedals – soft, sostenuto, and damper (with half-damper capability) – just like our grand pianos. The handy built-in digital metronome comes with a variety of time signatures, perfect for practice. You can control the tempo and the volume of the metronome. The metronome also features 30 built-in drum rhythms in a variety of musical styles. Tempo and volume of the drum beats can also be controlled. The CE200 comes with 29 Piano Songs in its internal memory. An accompanying music book is also provided. The CE200 offers an easy to use 2-Track / 3-Song capability recorder for capturing your keyboard performances. Both the 3 MIDI jacks and USB jack are useful for connecting with other musical instruments and computers. The instrument also has stereo Line In and Line Out jacks. Dimensions > 54" x 20" x 35"